TODAY IN GOSPORT’s PAST:- on 26 September 1860, the town received its first supply of water from the Bury Cross waterworks at the north end of Jellicoe Avenue. The view above was taken from close to The Wiltshire Lamb, on the corner of Privett Road (formerly Bury Road), the area in the left foreground is now occupied by a garage, the fire station and ambulance station. The large water tower (on the right of the photo) wasn’t built until 1865, as the original water tower was found to be inadequate; I’m not sure whether the taller tower in the photo is the original. 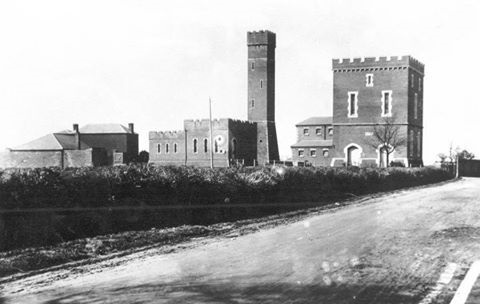 Gosport Waterworks Co. opened new works, wells & towers at Foxbury Point (1896-1903) and Mislington, at Soberton (completed 1907), and in 1907 the Bury Cross waterworks was rendered redundant, as it had been superceded by the other works, but was kept open in reserve. Although opened in 1896, Foxbury didn’t get a water tower until 1900, so water supplies from Foxbury were low pressure until then. It soon became apparent that salt water from the harbour was seeping into the Foxbury supply, and it was abandoned in 1903. The Mislington works began supplying water on 24 May 1907, after which date Bury Cross was kept in reserve, and Mislington and it’s connected wells alone supplied Gosport’s water for the next 41 years. Bury Cross waterworks (or most of it) remained in place until demolished c.1972. I always considered it to be something special as a kid; you couldn’t move for forts in and around Gosport, but it took the waterworks to build a castle!